Nepal remains a priority country for emergency response preparedness within the Asia-Pacific region given its high risk to natural hazards. The country’s mountainous terrain poses significant logistical challenges to access and deliver relief to remote areas. Since 2005, around 35 disaster events (floods, landslides and earthquakes) affected about 7.8 million people and caused over 10,000 deaths, mostly by the 2015 Gorkha earthquake. 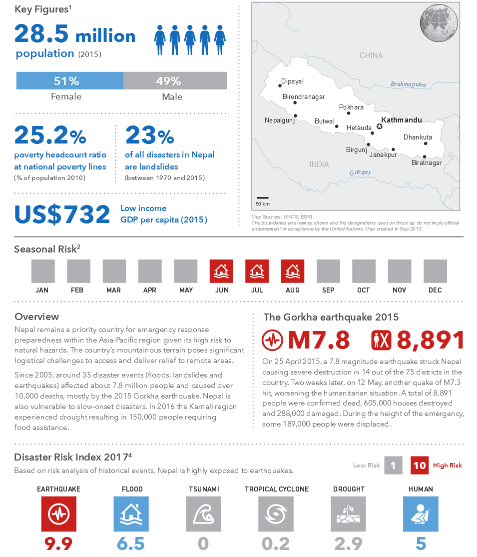 Nepal is also vulnerable to slow-onset disasters. In 2016 the Karnali region experienced drought resulting in 150,000 people requiring food assistance. To learn more about OCHA's activities, please visit http://unocha.org/.